This recipe is featured at Gluten Free Girl. Combine wet, room temperature ingredients; pour into baking pan. All dry ingredients, including the Active Dry Yeast, should be thoroughly blended together before adding on top of the wet ingredients. Mixing them together in a bowl with a wire whisk or shaking them together in a gallon size, self-sealing plastic bag is suggested. Gluten-free flours are very fine and need to be well blended before liquid is added to them. Select a NORMAL or BASIC cycle; start machine. For bread machines with a BAKE ONLY cycle, select the DOUGH cycle for mixing and rising. Press STOP when the cycle is complete; then select the BAKE ONLY cycle to complete the bread. After the mixing action begins, help any unmixed ingredients into the dough with a rubber spatula, keeping to edges and top of batter to prevent interference with the kneading blade. When the bake cycle is complete, remove the pan from the machine. Allow the bread to remain in the pan for approximately 10 minutes, then invert pan and shake gently to remove the bread. Cool upright on a rack before slicing. In a mixing bowl, combine wet, room temperature ingredients and mix well. All dry ingredients, including the Active Dry Yeast, should be thoroughly blended together before adding to the wet ingredients. Mixing them together in a bowl with a wire whisk or shaking them together in a gallon size, self-sealing plastic bag is suggested. Gluten-free flours are very fine and need to be well blended before liquid is added to them. With the mixer on a low speed, gradually add the dry ingredients to the wet until well blended. Beat about 10 minutes. 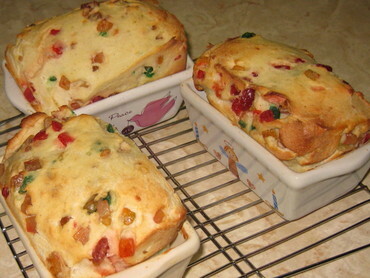 Pour batter into three 2 x 5-inch greased bread pans or one large 9 x 5-inch loaf pan; allow to rise approximately 1 hour. Bake at 375°F for 30 to 60 minutes respectively; use a toothpick to test for doneness. When baking is complete, remove the pan from the oven and wait for 10 minutes before removing the bread from the pan. Cool on wire rack before slicing.